Last month we learned that felt matters. The quality and make-up of the felt determines the impact point and subsequent character of the piano as the hammers strike the strings. In response to that, the strings themselves vibrate and begin the process of making sound. 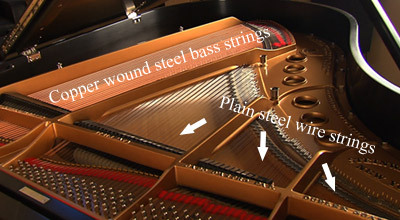 We learned in the discussion of string tension that there are on average 230 strings running the length of the piano, two thirds of which are plain wire and one third is copper wound bass strings. When doing piano research, what matters regarding the strings? Isn’t wire just wire? Piano wire is made up of drawn steel with carbon content of more than 0.80% which means it has high tensile strength to deal with the demands of piano tension (often 18 tons or greater). It also is ideal in that it is easily bendable and can be worked around tuning pins without breaking. If you look at the plain wire strings on a piano, they may look the same but they are actually graduated in size. The top strings are quite thin and they become thick near the middle. Thick is relative because the difference from one gauge of piano wire to the next is 1/3 of a human hair! 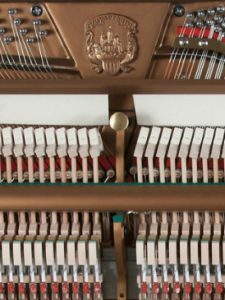 There are about 24 sizes of plain wire that can be used on a piano but most pianos incorporate usually about a dozen different gauges. The bass strings vary immensely as they have not only a steel core wire but they’re also wrapped in copper to give greater mass. And while the possibilities are limitless physically, what is optimal to sound pleasing to the ears narrows these choices significantly. 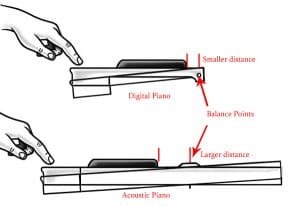 The decisions made regarding string gauge is part of the blueprint for a piano called the piano scale (not to be confused with the 7 notes on the keyboard also called the piano scale). The blueprint mathematically is calculated as a starting point to determine what gauge of wire will best suit the piano. Before we discuss wire, however, we need to understand the concept of standing waves and how they relate to making music. If you enjoy science, the video below does an excellent job of describing strings and string waves. 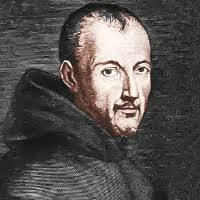 Around the time of Galileo, a French monk named Mersenne (1588-1648) is credited with discovering the relationship between string tension, length and mass. 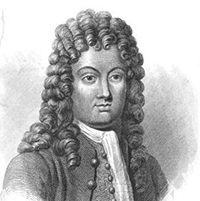 But it wasn’t until 1715 that the mathematician Brook Taylor (1685-1731 ~ born the same year as Bach!) wrote about the solution to calculating string vibration. 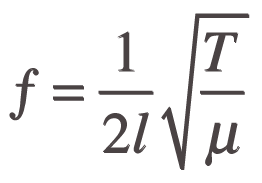 And so the formula became the Mersenne-Taylor formula to calculate frequency of a vibrating string. If you’re a tech head, the formula for string tension is shown above where m=mass of the string (shown as Greek letter “mu”), f=frequency (pitch of the note), l=length of the string inside the piano and t=tension. It’s at this point that most eyes start to glaze over. Talking about string gauge to 99.9% of the population is about the same as piston clearance when you’re buying a car. The data is simply irrelevant unless there is some tangible connection. String design has been incredibly streamlined over the last 20 years due to both historical data and the advent of computers. Pianos built today have the great advantage of historical designs. It is important to hear pianos from yesteryear; pianos that were stunningly beautiful in tone and ones that went incredibly wrong. When I visited the keyboard museum in Vienna and viewed keyboard instruments (pre-piano) dating from the 1700’s, it became apparent that trial and error has always been the starting point. But make no mistake about the fact that by early 20th century, string calculations were well under way. Computers now can re-calculate and optimize strings at the touch of a button. 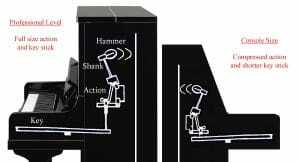 While pianos over the last 150 years underwent trial and error, software now aids (but does not replace) mathematical calculations for pitch, length and subsequent decisions about mass and what gauge of wire to use. 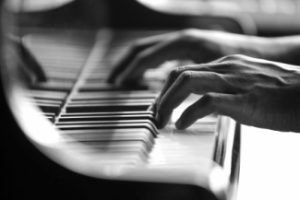 What does math have to do with piano tone? Since volume (amplitude) of a string is related to its mass, make sure that the piano you are testing has even volume across the keyboard. Increased wire gauge means decreased amplitude. Although we’re not technically analyzing the string for density, alloys or mass, one can listen for discrepancies in the dynamics in the piano. While the hammers greatly affect the perceived character of the piano (brassy or felty etc), there are 2 types of sounds that come from strings themselves. I would describe them as tubby and nasal. 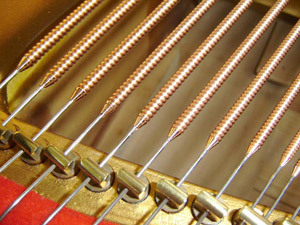 Disproportionate wire gauge (either too high or low) can make pianos have areas where the tone is not full but rather nasal and thin. Conversely, I’ve often heard strings (especially near the crossover) that sound thunky or tubby. It’s worthwhile checking for uniformity in tonal quality across the piano. 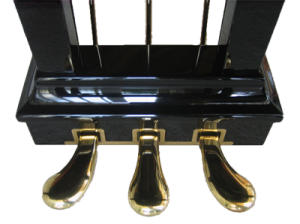 In short, the body for the tone of each note on the piano is called the fundamental. The overtones of the waves we learned about in the aforementioned video are the harmonics. They are multiples of the fundamental. Inharmonicity then describes the frequencies that deviate from the body of the tone. The inharmonicity might be considered discordant but without any inharmonicity, the piano lacks character and is quite often considered too cold. If the piano contains notes that are overtly “clashing”, it could be related to the strings. The balance is that the piano strings don’t have an exceeding amount of inharmonicity nor do they lack body and character. Piano wire is drawn wire which you can read about here in our interview with Mapes. It is a process of making the gauge smaller by pulling it through dies. The steel alloy “recipes” that are used are quite guarded, often even patented and vary from maker to maker. Not all wire is equal when it comes to sound. In the bass, the copper wrapped strings can either be made by hand or automatically by machine. When copper is added to the steel core, the overall mass is changed and subsequently, the pitch is lowered without drastically altering the tension. Bass strings have their own character and are worth listening critically to each note. Whether machine made or hand wound, bass strings need uniformity to deliver the appropriate character, fullness, power and vibrancy. You won’t be researching pianos very long before you come across string makers. 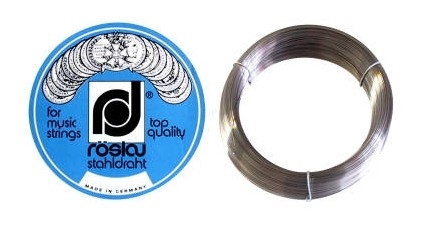 Without question, the giant in the industry touted as the go-to for plain wire is Röslau, from Germany. Piano makers can buy wire from a number of sources but if there’s an upgrade in strings, it usually comes from Röslau. Bass strings are often made in-house by the manufacturer either for cost savings or quality, being considered a specialized part of their design. There are also a number of independent makers who are outsourced in the making of bass strings as well. As stated with piano felt, it is simplistic to think that tone comes from just one source. The piano must be viewed as a whole. It is difficult to isolate cause and effect and determining which factors come from what source takes experience. Regardless, if you’re doing your homework and researching what piano to buy, having a “smooth scale”, one that is uniform in volume, color and harmonicity is something worth pursuing. Why Upgrade from a Digital Piano? 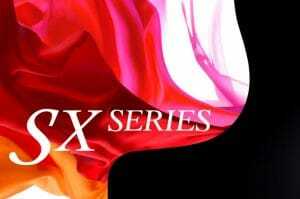 Why Upgrade to a Professional Level Piano?